First off, we’ve added electrical services and changed our company name to Bradley Kelly Construction Electric. Secondly, we have a new logo. And third…we’ve just launched our new website! About a year ago, Bradley Kelly created added electrical services to our offering including electrical installations, high-voltage installations, and electrical maintenance and commissioning. After being in business for over 35 years—we figured it was time for the Bradley Kelly brand to experience a bit of a refresh. Namely, we went about refreshing our corporate logo. 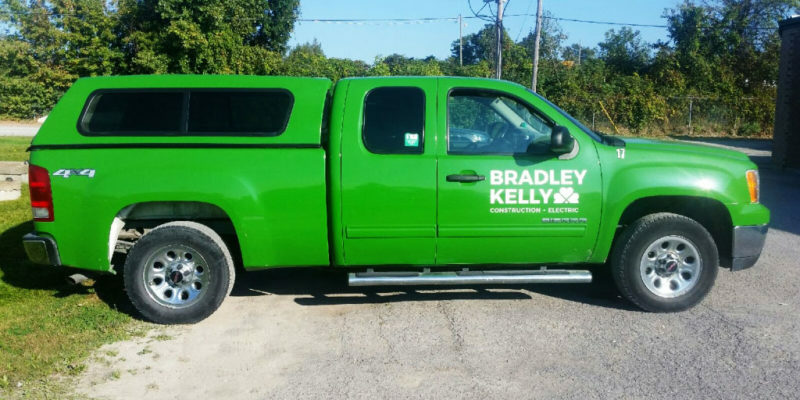 Our kelly green-coloured trucks are instantly recognizable at construction – and now electrical – project sites across Ottawa. Our signature green colour is a reflection of our Irish heritage so it remains our primary corporate colour, but we have modernized our logo – and we think it better reflects our growing company. Above all, we wanted to ensure our logo represented our company’s character and corporate values. Over time, you will start seeing the new logo everywhere: not just on our trucks, but our business cards and other marketing materials—like our website! To go along with our new look and feel, we also launched our new website in December 2017. Our website provides a fresh and modern look with all the functionality of a fully responsive website – so the site will function well no matter what device you view it on. While you’re here, we invite you to take a look at our new website. Check out the Bradley Kelly story, learn more about our commitment to safety, and get to know members of the BK team. Meanwhile, please keep coming back for blog updates. We hope you like the new website as much as we do. These are certainly exciting times for Bradley Kelly! Questions about Bradley Kelly’s new name, logo or website—or want to know more about our newest services? Click here to contact us.